Visiting the KBI and hearing the firsthand experiences of the migrants we serve humanizes the border. Here, Brophy students listen to a man at the comedor tell his story. This month, our media report covers the new asylum protocols and continuing family separation in the U.S., escalating repression in Guatemala, and an uplifting report on the power of education and encounter at the KBI. New “Remain in Mexico” Asylum Policy: The Trump administration is beginning implementation of a new policy announced in December—called “Migrant Protection Protocols”—which would require asylum seekers to stay or be returned to Mexico as they wait for their claim to be processed. This shift in asylum rules violates Congressional instructions that allow applicants to remain in the U.S. throughout the process as well as international conventions. Moreover, it raises concerns about the ability of civil society and the Mexican government to support people as they wait and, most urgently, migrant exposure to crime in such exceedingly vulnerable circumstances. Read more about this dangerous, potentially deadly, policy here: https://www.azcentral.com/story/news/politics/immigration/2019/01/26/arizona-border-aid-groups-seek-answers-new-asylum-policy/2681886002/ and https://www.vox.com/2019/1/24/18196537/asylum-trump-mexico-remain-return-deport. KBI’s Educational Programming: The KBI’s educational programs and immersion experiences bring people together and make the migrant experience more palpable for those who have not endured such displacement, risk, and uncertainty. In January, on a day-long immersion, students from Brophy College Preparatory made their monthly visit to serve migrants in the comedor, hear their stories, and learn more about the reality of the border. 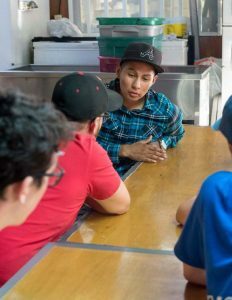 As this article and video reveal, it is a deeply humanizing, transformative experience: https://www.azcentral.com/story/news/politics/immigration/2019/01/28/brophy-college-preparatory-students-us-mexico-border-feed-migrants-learn/2598841002/. Ongoing Family Separation: After a public outcry and an injunction from a San Diego federal court, the U.S. Department of Homeland Security ended its practice of separating families at the southern border. While over 2,000 children torn from their parents have been reunited with their families, hundreds more are still in shelters and foster homes. Now, the separation of children and parents is continuing, this time targeting parents or guardians suspected of gang affiliation, though evidence is often meager or undisclosed. Learn more about this development and how it is impacting the families affected here: https://www.houstonchronicle.com/news/houston-texas/houston/article/Migrant-parents-still-separated-from-children-at-13458621.php?utm_campaign=CMS%20Sharing%20Tools%20(Mobile)&utm_source=t.co&utm_medium=referral. Crisis in Guatemala: Repressive government actions and corruption in Guatemala continue to drive migration from a country with a painful history of military dictatorship and civil war. Last month, President Morales formally expelled the U.N.’s International Commission against Impunity in Guatemala (CICIG), the body responsible for investigating impunity and corruption, including alleged irregularities related to Morales’ 2015 election. The United States has done little to protest President Morales’ decision, which has allowed him to continue to crack down on democratic institutions. These actions threaten the rule of law and the protection of citizens from criminal elements, and constitute what some have called a “slow-motion coup.” This report on the situation provides more information: https://foreignpolicy.com/2019/01/26/guatemalas-slow-motion-coup-rolls-onward/.